Western sanctions are having a significant effect on the realization of Russian LNG projects, one of the most promising segments of the gas market. In order to realize these projects Russia's largest oil and gas companies have turned to the government, which may be able to allot resources for their support. The Kommersant business newspaper has reported that the American company ExxonMobil, still considered Russian oil and gas giant Rosneft's main future partner in its long-term LNG (liquefied natural gas) project in the Far East, no longer plans on participating in the endeavor as an investor. However, according to the newspaper, Rosneft has already found a solution to the problem. The project may become a part of the bigger Sakhalin-1 project, which is not affected by the sanctions. Additionally, according to the rules of the agreement, the government may compensate the project's participants for their infrastructure expenses. Rosneft has stated on many occasions that it needs ExxonMobil primarily to obtain technologies and financing. However, in the summer of 2014 Rosneft was hit with U.S. sanctions. The American company then began to distance itself from the project, but not because of the sanctions, according to Kommersant, but because of the project's economic model. Rosneft has now found a solution. 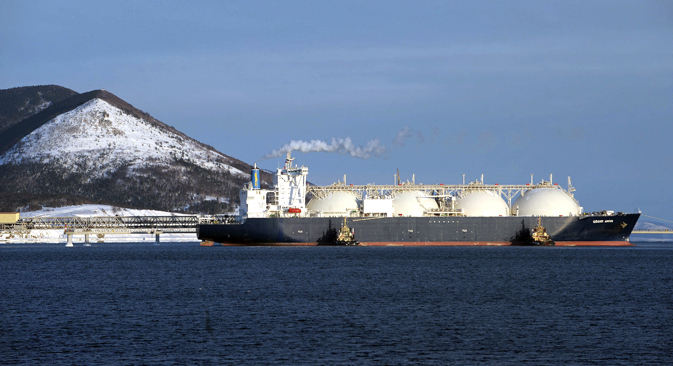 "Now Sakhalin-1 gas will be supplied to the Far East LNG project by the foreign shareholders in proportion to their share in the project," reports the newspaper. Sakhalin-1 is owned by Rosneft (20 percent), U.S. giant ExxonMobil (30 percent), India’s ONGC (20 percent) and Japan’s Sodeco (30 percent). "The world has been using LNG for several decades now, whereas in Russia this segment of the gas market started developing only recently," says Dmitry Baranov, a leading expert at investment holding Finam Management. According to Baranov, some of the results are already clear: The first LNG plant has been opened in the Far East, contracts for supplying Russian LNG to other countries have been signed and other projects for liquefying, transporting and using natural gas in Russian are currently in the development or even the realization phase. "All this should help the volume of LNG production in Russia and increase the country's share on the world market," says Baranov. Moreover, he argues this will help achieve the goal of Russian energy strategy: To increase the volume of LNG exports to 30 million tons by 2020. The Far East LNG project is not the only one to have experienced financing problems; other projects dealing with the production of LNG are in the same boat. In particular, French company Total announced on September 23 that it is looking for new sources of funding for its LNG project in Russia, Yamal LNG. The company is working on this project with Russia's largest independent natural gas producer Novatek . Total has a 20-percent share in the project, and furthermore has an 18-percent stake in Novatec itself. According to the official announcement by Total's CFO Patrick de la Chevardiere, "access to dollar financing is closed due to the sanctions." Novatek was hit by the U.S. sanctions back in July 2014. As a result, in the words of Monsieur de la Chevardiere, Total is now negotiating new financing from French and Italian export-credit agencies, as well as from Chinese and Russian banks. Moreover, Novatek itself has asked the Russian Economy Ministry for 100 billion rubles ($2.6 billion) from the National Wealth Fund, a special reserve made up of Russian oil and gas earnings, similar to the Norwegian Sovereign Fund. In the beginning of September 2014 the volume of the National Wealth Fund was 3.15 trillion rubles ($82.1 billion). The development of LNG, according to experts, can be viewed as an object of national importance and therefore it is worth financing. "Obviously, the development of the LNG segment will help the creation of new work places in the country and increase budget revenues on all levels," says Baranov. "Moreover, additional support will be given to partner sectors of the gas industry and we can expect a certain revitalization of the economy in general." He believes that not only is it possible to develop Russia's LNG segment, it is necessary, and as soon as possible, in order to catch up with other nations and begin to capitalize. However, according to chief analyst at UFS IC Ilya Balakirev, "the LNG projects are in a state that will require years for them to reach industrial dimensions and return the investments. That is why Russia is supplying gas to where is has always supplied it. “The European market is the most important one, since, in any case, it has the biggest margins for Gazprom and it is the largest market in terms of volume."